Sorry, we are currently sold out of 'Mexico Chiapas Las Delicias'. Please check back later. This 'Las Delicias' coffee was produced by 21 smallholder members of E-Café Chiapas farming near the community of La Independencia in Mexico's most southern state. 'Las Delicias' means 'delicious things' in English, and the coffee is a testament to the delicious possibilities in coffee that the region has to offer. However, the story behind Las Delicias goes beyond the delicious product itself into transforming the lives of coffee farming families. E-Café - the organization to which the contributing producers belong - is a faith-based social enterprise established to improve the livelihoods of farmers within Mexico's poorest state, Chiapas. The organization seeks to alleviate and, ultimately, eliminate poverty by helping small scale, indigenous coffee farmers in Chiapas to improve the quality of their coffee and find new markets for their product. E-Café provides support, training and financing to their members (in addition to milling and exporting their coffee) and is committed to ensuring that the 'E' (in E-Café) continues to stand for Enterprise, Environment, Empowerment and Eternity, reflecting the organization's commitment to community development through economic empowerment. While coffee is the largest income generator and primary livelihood improvement activity for the organization, it is a relatively new endeavor for them. They began their charitable work in the region by fully funding a University-prep high school for rural young people, an activity which they continue to fund today. The Las Delicias community is a steep two hour drive into the mountains north of Independencia where the small village is home to around 50 households. All families living here are entirely dependent up on coffee production for their livelihoods. Las Delicias producers work to improve soil fertility, which impacts both cup quality and productivity and they have also established worm composting modules to process coffee pulp and other organic waste into fertiliser for coffee plants and other crops. Each contributing farmer currently only produces 10-20 bags of coffee annually so overall production is very small, roughly a single export container a year. Coffee is usually pulped at the individual producers' homes - though some share infrastructure according to family affiliation. Coffee is delivered via multiple methods - from walking to trucks to donkeys - on the same day that it is selectively handpicked. The coffee is then sorted to remove any under-ripe and damaged beans and is floated in clean water to remove debris and insect-damaged beans. 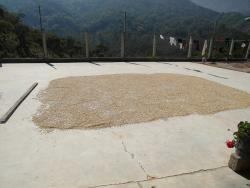 It is then pulped after which it is delivered to tanks where it is covered with jute for fermentation. After fermentation, the coffee is washed with clean water, which is filtered to remove solids and pollutants before being released. The coffee is then delivered to producers' patios to dry, where it is raked every 20 to 30 minutes to ensure even drying and constant temperatures. In most cases, parchment dries for 7 to 8 days before being bagged and delivered to E-Café's warehouse and dry mill. Mexico was severely affected by coffee leaf rust in the 2014/15 harvest. Producers across Chiapas saw 50 to 80 percent decreases in their production volume, and small producers, who typically can't afford the additional inputs necessary to combat coffee leaf rust were particularly hard-hit. While the crop was greatly diminished in size the coffee that grew without leaf rust was of excellent quality. Cup Characteristics: Milk chocolate and walnut aromas. Cup is vibrantly bright with very smooth, again milk chocolate texture and nutty flavors. Long velvety finish. Roasting notes: This coffee can be roasted across all darkness ranges. We always prefer lighter style roasts to accentuate any coffee's individuality, but this coffee is quite capable of attaining a satisfying dark roast as well. Extend the roasting time between first and second crack to increase depth.